I bought your book Ghostly Paws and I wanted to tell you how much I loved it. As a reviewer I tend to try to make a point to readers in hopes to get their attention and this time I want to point out to readers that authors loves it when fans drops a few lines to tell them how much they loved their book. So, this note and somewhat quick review (Oh yeah, I still have to do a quick review for them. LOL) will seem a bit odd, so please over look that tiny reviewing part. I am friends with author Mary Kennedy and she posted this book on her Facebook. Me being a cat, mystery, and paranormal lover I just had to buy it and I have to say I loved it so much I read it in no time. I fell in love with the setting, story and the mystery. You did great job writing the middle age character Wilhelmina and the whole paranormal aspects of the story with the added with all of the cats that is still in progress. I have to admit this was the first time I have ever read a book with a POV from a cat and I loved it. I especially loved the name of the cat Pandora, but again I could be partial to that name because one of my cats name is Pandora ;) Anyhoo, back to the story, oh yeah, I can’t forget about mentioning the sheriff Striker, Oh my, he is a hot one and I hope we continue to read more about him and Willa together in the next installment. I really enjoyed the mystery and the way Willa was always in the way trying to help solve the murder. I also enjoyed how you added the feral cats, I hope this little message will encourage some to help the feral cat population in their area. I myself trapped 5 feral cats this year and took them to get them fixed. I cat wait to see how you grow this cat colony and how they are going to help with the paranormal elements in the story. As a paranormal readers I have always felt cats just go hand and had with a good paranormal book. So, I guess I can quit with all of this mushy love stuff and ask one important question, WHEN IS THE NEXT BOOK COMING OUT??? Yes, I want it now LOL. 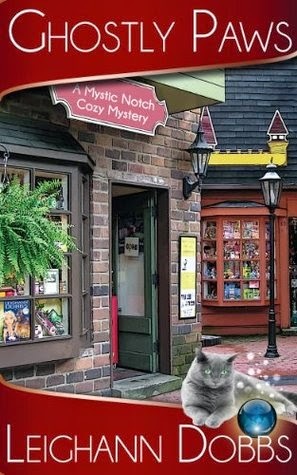 If you’re a cat, mystery, paranormal and a touch of romance lover please mark this book to read. It’s on my highly recommend list. I also hope this crazy note/review will inspire you to write to the authors and tell them how much you loved their book.